Is Learning Violin really that hard? I am wanting to learn the violin, every where i look, be it internet or people, they said it the hardest instrument :( so advise? ysckyler > with your passion to do a 20 hour gig is gonna reap something > and that something will ROCK ya. This is a marvelous instrument. Keep strong and don't let anybody put you down especially yourself. > Bring It!!! > It will change your existence on this rock we are hanging out on. Your are gonna DIG IT!!!! Love your energy, I will definitely DIG IT! It going to be legen - wait for it - dary!!! LOL - we are all waiting for it. go for it. I don't mean to scare you, but most of the estimate I've heard have been 10,000 hrs or 5 years. Can any time length be put on how long it takes to learn ? There are too many factors. It also depends on a persons goals and what level of expertise they are shooting for and what they are trying to play, level of difficulty, etc. One important bit of wisdom I've taken from FM is something like, "Learn to enjoy the simple things." That means to recognize and take pleasure when you can do any one thing well. Hitting the right pitch, hitting a rhythm exactly on time (even if it's not yet as fast as you want), getting good tone, playing scales, and similar skills. Those can be your building blocks. Along the same lines is to not try to play tunes, but to play each note of a tune. That means to take care to get each note right. It's not so hard to play a tune so that it's recognizable. But to make the whole tune sound good means playing each note well. If you can make steady progress in these kinds of things, you are on your way. I know Well i already book my first lesson on 26th Oct. Can't wait to start lesson. "Learn to enjoy simple things" So true. Found this thread after practice tonight. The video attached is pretty close to spot on. Let me 'splain. My husband was/is a flight instructor. The FAA minimum for solo is 10 hours of training. The national average is about 20 hours. After 10 - 20 hours of flight instruction, a student can take off and land, navigate, communicate, read a map, understand the instruments and knows the basics of what to do if the fan in the front stops running. Are you ready to step into a 747 and do this for a living? No, but you have the skills to enjoy taking yourself on a short journey and returning home safely. I solo'ed in the morning. After lunch, my husband sent me on my first solo cross country from North Las Vegas to Mesquite, about an hour flight one way going 90 knots. Was I perfect? Nope. Were there things I could've done differently or better? Yup. But I had the basic skills to get the job done. Fast forward a few years and a few hundred hours later. I was learning to fly a Cessna Caravan - a big step up from the volkswagon with wings I learned to fly in. Every basic skill I learned as a student was the same only amplified and expanded on. The Caravan is a turbine engine so it has more fancy colored lights and dials than a basic plane, but if you don't understand the basics you can easily roach an engine that costs $100,000. From watching my husband teach many people to fly, there are some basic rules of learning that apply to learning all things. 1. Law of Primacy - What you learn first, you remember first. In times of stress you resort to what you learned first. Bad habits will come back at the worst possible time. 2. Unlearning bad habits is harder than learning it right the first time. 3. Each skill builds on the one you learned the day before. 4. You must practice frequently and at regular intervals (once a day, every other day) until a skill is mastered. Sporadic practice slows your progress. Try to have discipline to commit to learning. 5. Good pilots are always learning. Anyone that takes on a skill should have this attitude for life. 6. Don't skip the basics and be in a rush. The basics skills of any task are the foundation for the advanced skills. 7. Use the three step method to learn a skill - talk through it, walk through it and then run through it. Learn the skill academically first. Then go through all the steps slowly until you can do the task well. 8. Never underestimate the value of book learning while learning a physical skill. Book knowledge does get put into practice in the real world whether that's how to operate a turbine engine or how to read music. 9. Have fun! If its not fun why are you doing this? This site is phenomenal. Pierre's videos on the basics are great. Don't be in a rush to get to the destination - enjoy the journey of learning. I just started to play as well. In 20 hours, I'm guestimating I'll be able to get a decent sound out of the violin, play scales in first position and scratch out a basic song or two that another person could recognize and not drop to their knees howling in pain. Will I be ready for the symphony orchestra? Nope. But I'll be on my way with a good foundation of skills ready for a lifetime of learning and enjoyment. Well said, New... in fact, everyone. Great thread. I just wanted to add my own observation that the right instructor will make worlds of difference. I started playing about a month ago, and I was getting really inconsistent results. A number of factors eventually led to me seek a different instructor and she instantly showed me why my sound was so inconsistent and how to fix it. Loving this even more with each practice! Not as wicked as jumping out of planes - which I did for many years until heredity and arthritis kicked in. 😉 You can do anything you put your mind to and put the effort into. Remember what the video said, "We don't like to feel stupid". This site gives you some basics to try and get comfortable with before your lesson to get over that emotional block. If you've never done something before don't expect perfection. I don't know too many people that do things right the first time. Strive to get better each day. I hope you get a really good instructor. That makes all the difference in the world for learning any skill. Learning is a mental game. Muscle memory comes with practice. BTW - where are the emoticons? I don't see them on my reply menu. You need to memorize the code for them. When you are in the reply text area, look below your text to the left for a Smileys button. After pressing that button you'll see more smileys than you may care to see. I wanted to please everyone and kept adding all kinds of requests. Glad I'm an engineer or the math thing would might be a challenge too! It time to update this thread again. I was so suppose to register my class last weekend, alas the instructor were away, so I set up to meet them this weekend to discuss my violin lesson and my journey. 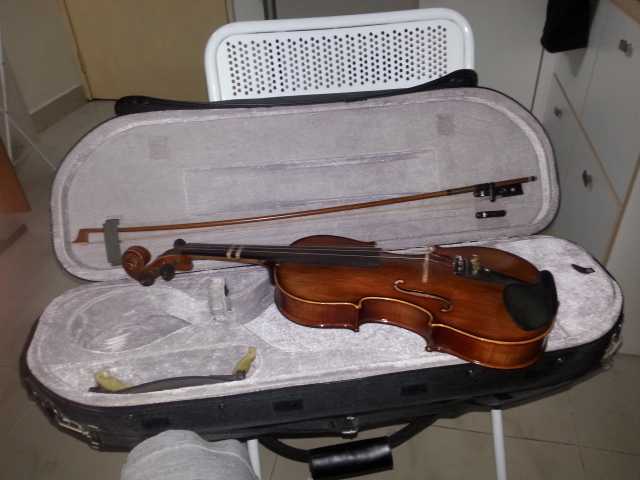 Good news, my god father used to have violin lesson have been busy, so he loan me his violin lesson till i get better and save up to buy a decent one. He said that no point buying a cheap one and then splurge on a better one, better get a really good one from the start. In the mean time, i just use his until i can afford a good one. 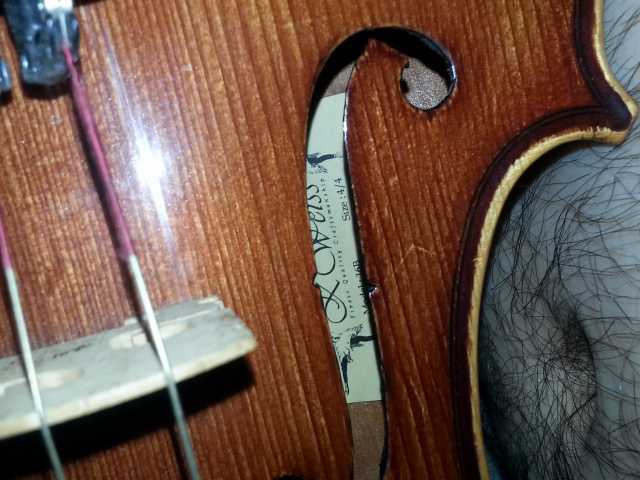 So here my violin, i do not know what brand. Something Weiss model 16b 4/4. If anyone recognise it, can give me some feedback on how good this brand is? 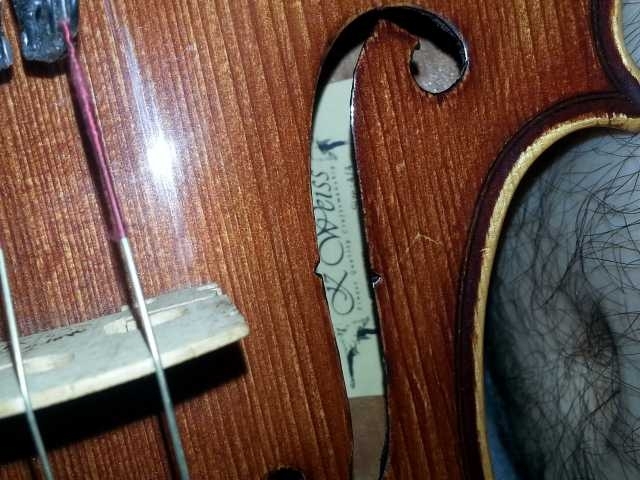 I definitely curious but can't seem to find any info online because I do not know the first letter of the brand and cannot find the 2 ballerina logo on any violin model. But anyway, am glad i can use this time to learn some basic before i go into class. So i still remember my 20 hour challenge, and i will later on open another thread to document my journey. My official journey start when i official learn my first lesson. Just a quick update. I have finally started my lesson and today the first day!!! So damm excited!!! I finally know how to read musical notes, the teacher makes it all so simple. Now i just need to learn how to read it on the fly. The teacher method of teaching is called the EADG method. I try google it, but it seems that this method is solely his. Well i just now need to practice, practice, and practice some more. Well, now the 20hour challenge begins : I have had 30mins lesson today, and due to the mute i order does not fit, i cannot practice again until tomorrow. So anyone knows a mute that can only be heard in my room is welcome to chime in. Only thing it that your bridge has to be thin enough to get it on and you could get marks on the bridge since the mute is solid.